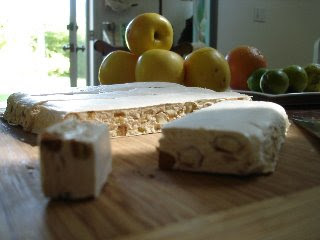 I can't begin to tell you how satisfying it was to accomplish the feat of making Nougat de Montelimar from scratch. Thankfully my aunt marie did all the planning, heavy lifting and generally got the enthusiasm going for it. She had made it before and this time I got to learn. I couldn't find a recipe to share with you online so I'll just describe the process to give you an idea: add boiled honey and boiled simple syrup to whipped egg whites, add toasted pistachios and almonds, pour into pan, let sit for a day. Now if there was a way to adequately describe how thick and glue-y this stuff gets (my cousin broke a wooden spoon making it) I would. Let's just say that even the kitchenaide has trouble mixing this stuff. 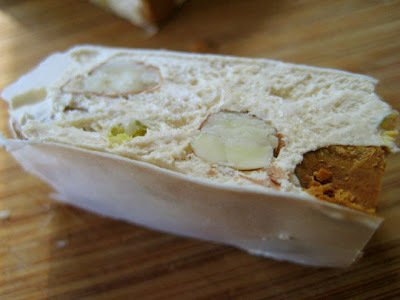 But the result...I can't even believe how much what we made tastes like the real thing. But seriously, I have to make those donuts soon!